Being sick or having someone in the family suffer any form of sickness can be hard. What more if the disease is as serious as dengue? I have seen family and friends faced this threat and I wouldn't want anyone, especially my loved ones, to go through it. That is why I feel like a mad mama each time I see a mosquito hovering around my son. But then, mosquitoes can be persistent. They are ready to attack a few seconds after you divert your attention somewhere else. With this, I believe I need something that will keep my family and myself protected all the time. Here is the complete list of the items included in our anti-dengue arsenal. This variant is G6PD-safe so this is a must-have for us since my son has G6PD deficiency. The scent is okay in my opinion but since I'm not a big fan of applying oils, I would love it if they'll come up with a water-based variant. This 100ml bottle costs Php 169.75 online, Human Heart Nature branches and dealers nationwide. My husband and I have been using Milea Organic shampoos for more than two years so it make sense that we try their insect repellent product. I love that it is water-based so it isn't oily to apply. The scent may be overpowering to some especially to children but for me it is tolerable. After all, the scent tends to tone down after a few minutes. I have tried using this to my son as soon as he turns one and we haven't gotten any negative reaction so far. I love products that are both useful and fashionable. The bracelet (can be used as an anklet) is made of suede strips infused with citronella, lavender and peppermint. It comes in various colors too although pink was the only available color at that time. 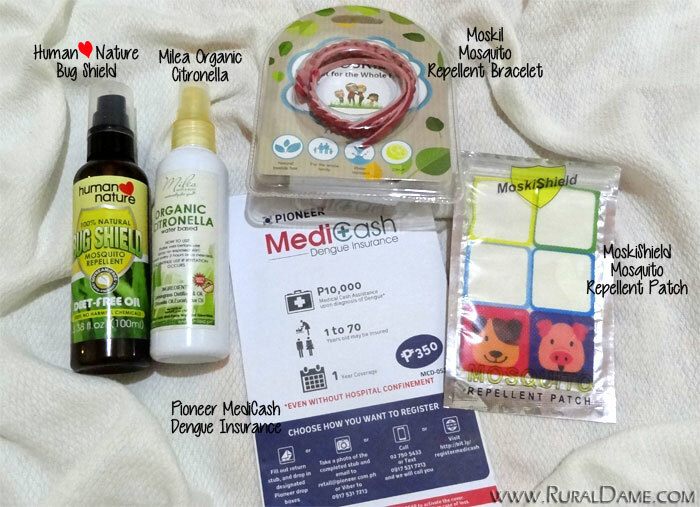 One pack costs Php 115 and contains two bracelets.While it is intended for the whole family, I discourage the use of this to babies and toddlers especially those who are still teething as they might end up chewing this. The patch comes in cute animal designs however the scent is a bit strong for me so we rarely use this on our clothes. I prefer sticking a few on our bedroom door to prevent mosquitoes from entering the room. This one is not an anti-dengue weapon but more like a dengue support. For Php 350, you will be given Php 10,000 medical assistance upon diagnosis of dengue and you don't even need hospital confinement. The insurance covers one to 70 years old for one year. While we can put our mind to rest because of these products, let us not forget that keeping our surroundings clean is one of the most effective ways to combat dengue. Additionally, staying healthy by eating properly and getting enough sleep can help strengthen our immune system thus will enable us to recover immediately in case we failed in avoiding the mosquito's wrath.